There's no denying smart phones. They are an increasingly important part of our society. A recent study shows people check their phone an average of 110 times per day! One of the keys to marketing is the ability to communicate your message to the customer when they aren't thinking about your product. With this in mind, Cinema Hosting set out to create an affordable mobile app for movie theatres. Give your customers the impression you are on the cutting edge of technology when they hear "have you downloaded our app?" The ability to communicate with your customers when they are not thinking about your theatre is another key to successful marketing. Let's say you are having a special Throw Back Thursday event...wouldn't it be nice if you could send your customers a push notification on Tuesday reminding them of the event? That's the price you would pay an app developer to create an app with our list of features! And once they completed the app, you would have to pay someone to update the app with movie information! Spoiler alert: we don't charge anywhere near that amount and we handle the maintenance for you! Another key is to keep the app out and available for all your customers. New people download your app everyday. It will probably never reach millions of downloads, but it will be downloaded by a surprising number of people. We have a theatre in a community of 20,000 people with over 5,000 downloads! 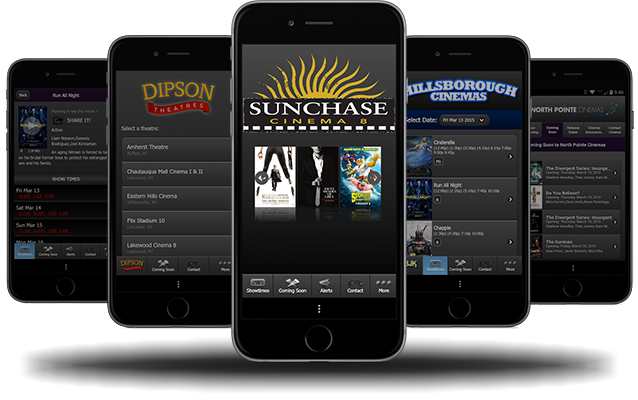 Since the app is only displaying your showtimes, the customer won't know what's playing across town at your competition's theatre! Positive branding of your theatre is what keeps customers coming back. Whether it's friendly staff, clean theatres or free refills, these all contribute to your brand. Having an enjoyable experience on your mobile app helps solidify your brand for customers. When your theatre is an icon on their home screen, your customers have access to all of your showtimes and theatre announcements. Not too hard to imagine as it happens a lot! What is your standard answer? It probably has something to do with making sure the customer gets their showtimes from your website. This is good, but often times it doesn't resonate with your customer. It's not something they can act on in that moment. It is immediately actionable as they can grab their phone and download the app. Customers get a little endorphin release when they hear they can download a new, helpful app. The customer is impressed by their local, tech-savvy movie theatre. One customer has seen a dramatic decline with this exact scenario. They've gone from 4 to 5 complaints per week to about 1 per month....simply by asking "Have you downloaded our app?"